Arnold Hutschnecker came from a Jewish family. During the First World War he served in the Austrian army and after the war he was educated in Berlin. After his graduation in 1925 he worked as a psychiatrist in Berlin. He read "Mein Kampf" and publicly referred to Hitler as a pig. After members of the SS who were among his patients had warned him that he was in danger he emigrated to the USA in 1936. In 1934 he had married Florita Plattring, who died in 1966. He practised as an internist and specialized in pychotherapy during the 1950s. Among his patients was Elenonora from Mendelssohn and the pills she used to commit suicide in 1951 were possibly subscribed by him. In 1951 he published the bestseller "The Will to Live". It was read by Richard Nixon who visited him frequently in 1952. They remained friends and Nixon still consulted him when he was president. The last time they met was in 1993 at the funeral of Pat Nixon. In 1970 Hutschnecker authored a report that suggested to test all children aged seven or eight to see if they had a violent nature. He stated that problematic children should be treated in camps and this earned him a lot of criticism. In 1988 he stated that his report had suffered from ''malevolent distortion'' by the media. His last years he was unable to walk and had difficulty spreaking. He died in 2000, aged 102. 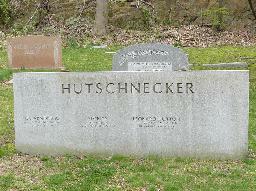 The grave of Arnold Hutschnecker at Westchester Hills Cemetery, Hastings-on-Hudson.